I just ordered a Splawn Quickrod and cab. I've read they're back ordered for three months. From the clips I've seen and the research I've done, they're worth the wait. Does anyone have any experience with Splawn? Exchanged emails with Scott Splawn and he seemed a nice guy. Other than that, my only experience is sound clips, the amps aren't easily come by here so I haven't been able to try one yet. Of what I know of the circuit design, what Scott has done with the amps is very clever and that is displayed in the great tone people get from them. If didn't have my significantly modded Plexi to play with I'd be seriously interested in one. I believe he started out modding plexi's. 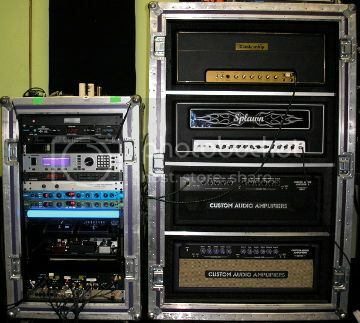 Here's where I got the idea, it's a high-gain amp shootout with audio clips of over 30 high gain amps. The Splawn was a modded plexi and I thought it sounded great so I did some research and I really like the sound of his amp line. There's lots of gain, but the sound doesn't seem as compressed as some I've heard. Anyway, here's the link to the shootout. Enjoy!